The printer is in a State of death and the power cord attached. Then off the button resumes, but not off POWER button. While pressing the POWER button, press the RESUME button 5 times. The led will light up alternately Flash green with orange of the last orange. (don't get mistaken 4 x because the printer will die in total). The led will blink briefly and then it will flash green. 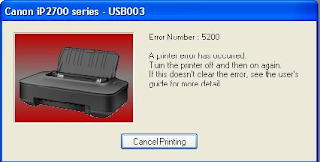 That's two ways to handle Error 5200 on printer Canon IP 2770.Hopefully useful!